A random herd of horses came ambling past my bedroom window this morning. I am not sure who was more surprised by it; Jesse, Jac or me. I happened to be looking out the window to see where the sun was rising when I noticed movement in the trees. The horses in the stalls & runs below the window also noticed. All of the horses started bucking and were excited…except for Jac. He stood perfectly still and stared. I think if horses jaws dropped open like humans, his would have been hanging on the ground. The small band of horses kept going past the pens so I went to the other side of the apartment to see where they would go. To my surprise the answer was…our horse trailer! 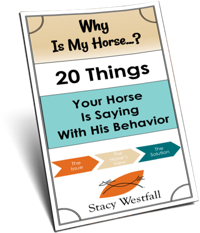 We had arrived late in the day and after unloading our horses we left the trailer open. Our horses had left unfinished hay in the trailer. You never know just what’s going to happen in Texas, lol, So glad that you made it here through all of the snowy roads. You are about 35 miles north of where I live would so love four you to do a clinic while you’re here. 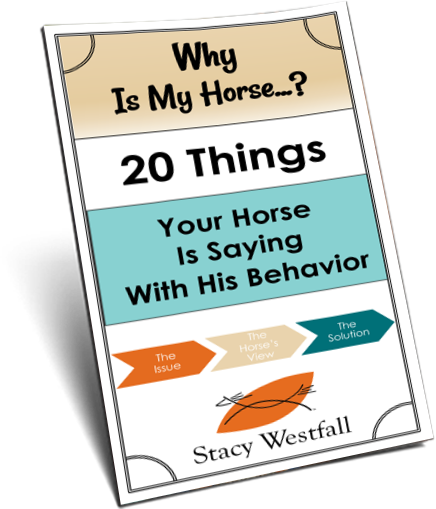 Funny thing how word gets around where the feed or hay is…they always know and tell each other! Got to love it. Gee no snow, wish we could say the same. Looks like you will have some excitement and change of life at your new place ! We camp at a horse camp on BLM land in Central Oregon. We have to make sure the hay and grain is locked up or the cows will help themselves during the night! I am sorry I am bothering you again….but…one more question…….could you tell us where JAC is??? Jac was on the other side of the barn…I didn’t grab the camera fast enough for his side of the barn. I will try to be quicker next time! Jac was in todays blog about it being HOT! The piebald appears pretty thin. I can go you one better was camping in primitive campgrounds in pop up camper, in 1977. We put coolers outside at night with 6 of us in camper. After we were asleep woke up to strange noises outside. The general store down the road rented horses out for trail rides, during the night they let them run. Since there was a pond where we were they grazed this area. They came over to our camper & started flipping lid on cooler outside checking out everything they could. Like being a little kid and wondering … why doesn’t a wild horse just come into my life … your case … your trailer! 🙂 1st of many new experiences… enjoy.